The humble apple is one of the most versatile of fruits, whether it’s for eating or drinking, sweet or savoury, there is an apple variety to suit most uses. 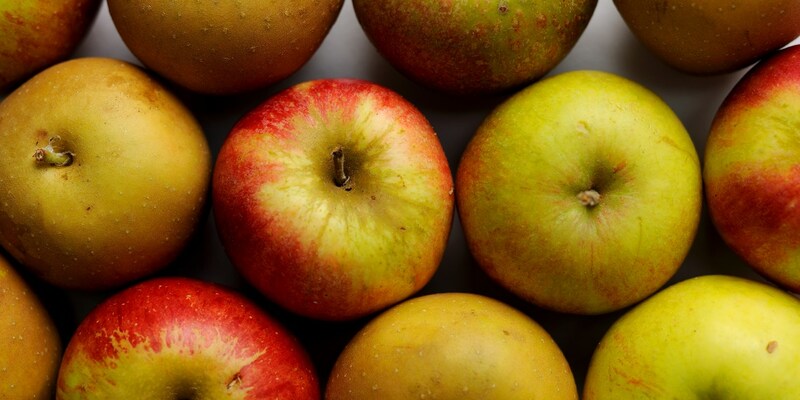 Traditional English apples vary from red-skinned Galas, golden Russets and plummy Spartans, to the king of cooking apples, the plump and fluffy Bramley. Apple is primarily used in desserts owing to its saccharine flavour once cooked. Often it is paired with other sweeter fruits like blackberry or pomegranate and is also wonderfully complemented by buttery pastry – which would explain why apple pies and tarts, such as Marcus Wareing’s tarte Tatin, are such treasured dishes. The most classic savoury pairing is pork and apple, as its tartness offsets the fatty quality of the meat, as in James Mackenzie’s gammon cooked in scrumpy cider. In the same way duck and apple, or apple and cheese make great combinations.